The notion of Research Infrastructures refers both to traditional large physical installations, as well as to facilities which “include networked resources and skill / capacity building initiatives. These resources use advances in information and communications technology and the big data revolution to underpin new collaborative methods of research”. 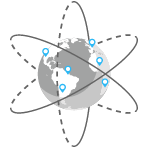 Research infrastructures may be based at a single location, distributed across a number of sites and organisations, or provided via online platforms. Europe hosts several large-scale research infrastructures operating across national boundaries. Research Infrastructures are the base on which the future federated EOSC will be built. They provide several types of services the EOSC, including data services and expertise. Research infrastructures are very experienced in providing cloud services to researchers, and as such, are key players in the specification and the set-up of the EOSC. Close cooperation with other research infrastructures and e-Infrastructures within the EOSC will increase the capability of research infrastructures to combine and integrate data and resources in a common environment. According to an internal survey, 93% of the EOSCpilot project participants currently engage with research infrastructures. This is the highest score amongst the whole range of stakeholder groups the project partners are working with. The added-value of engaging with EOSCpilot project activities for Research Infrastructures. Do you belong to a Research Infrastructure? First of all, we would like to get to know you and hear from you how you support Open Science. Here are some concrete ways to learn more about the EOSC and contribute to its shaping. See the EOSCpilot's policy outputs by visiting the Policy Theme page. Explore the discussions that took place in the 1st EOSC Stakeholder Forum in Brussels, Belgium, on 28-29 Nov 2017. All stakeholders gathered to discuss and share their views on the foundations of the EOSC. Participate in the EOSCpilot Governance Development Forum (EGDF) and join their thematic workshops. The second EGDF workshop will take place on October 2-3 2017 in Tallinn, Estonia, and will work on "Drafting Governance Framework and Principles of Engagement for European Open Science Cloud".